Researchers know that HIV jumped from apes and monkeys to humans on multiple occasions, in the form of HIV-like viruses called simian immunodeficiency viruses (SIV). To date, 11 out of 13 of these cross-species transmissions have been accounted for. On Monday, researchers identified the final two. There are two major types of HIV – the globally prevalent HIV-1; and the less common, less virulent, and less infectious HIV-2, which is mostly confined to West Africa. Past research has concluded that SIV jumped from sooty mangabeys – a species of old world monkey in which SIV is endemic – to humans on nine separate occasions, evolving into nine different strains of HIV-2. HIV-1, by comparison, is divided into four groups. Two of those groups – group M, which is responsible for the vast majority of HIV infections worldwide, and group N – have been sourced to strains of SIV carried by chimpanzees. But the simian origins of the remaining two groups, designated O and P, and the species of animal from which they first spilled over, has remained a mystery. Until now. Reporting in Monday's issue of Proceedings of the National Academy of Sciences, researchers led by Martine Peeters, a virologist at the Institute of Research for Development and the University of Montpellier in France, present the results of a comprehensive survey of SIV infections – not in sooty mangabeys, not in chimpanzees, but in African gorillas. 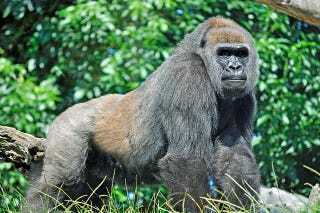 Their investigation turned up two virus lineages closely related to groups O and P.
"Two fully sequenced gorilla viruses from southwestern Cameroon were very closely related to, and likely represent the source population of, HIV-1 group P," the researchers write. "Most of the genome of a third [gorilla-specific SIV strain], from central Cameroon, was very closely related to HIV-1 group O, again pointing to gorillas as the immediate source." Read the full scientific study at PNAS. For more details on the individual HIV types and subtypes; the fascinating history of scientific investigation that led to Monday's announcement; and why disease researchers think chimp-specific SIV led to a global epidemic, while gorilla-specific SIV mutated into a strain of HIV confined almost entirely to Cameroon, see Carl Zimmer's coverage of the study for The New York Times.